Update. We did not move in as expected today. There was an issue with the heating and they need the heat to refinish the floors. They were supposed to sort that out today then do the floors tomorrow. So maybe Monday or Tuesday? At this point I am not holding my breath. This entry was posted in Uncategorized on November 29, 2014 by Nancy Hampton. 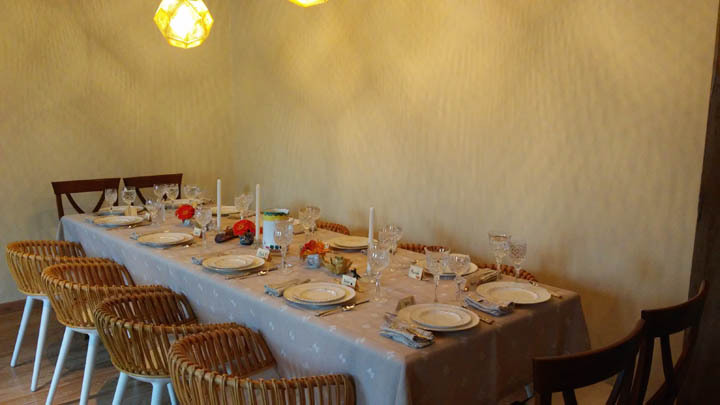 I am a lucky person to have shared our American Thanksgiving, and my first one in Italy with my good American friends Susan and Gary and their guests from California and six of our Italian friends and two Italian children. It was an amazing feast! It has been documented in pictures below. Alas, I was still cooking in the borrowed apartment as we are not quite ready to move into our place yet. My contribution to the meal was dinner rolls, green beans, mashed potatoes and cranberry sauce. The cranberries had crossed the ocean with Gina and Mark. I also decided to roast the little Cannara onions in balsamic vinegar, stock and herbs to share. I had to send Luther on an errand to buy a mixer and it was pouring rain. He manned up and walked to Formica and therefore made his contribution to the mashed potatoes. We gathered at Susan’s and Gary’s apartment at about 12:30. Gary, Gina and Mark had gone up into the Niccone valley to Calagrana to pick up the turkey. Since none of us have a big oven Susan had arranged with the restaurant to obtain and cook our turkey. 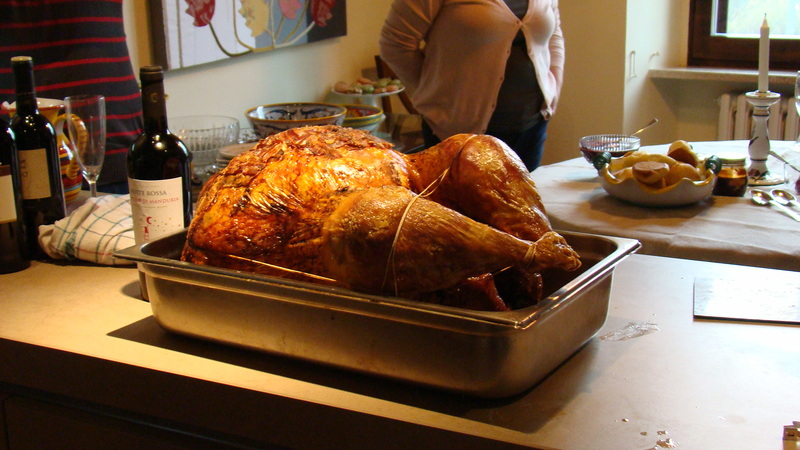 I might add it was the largest turkey any of us had EVER seen. 15 kilos or about 35 pounds! 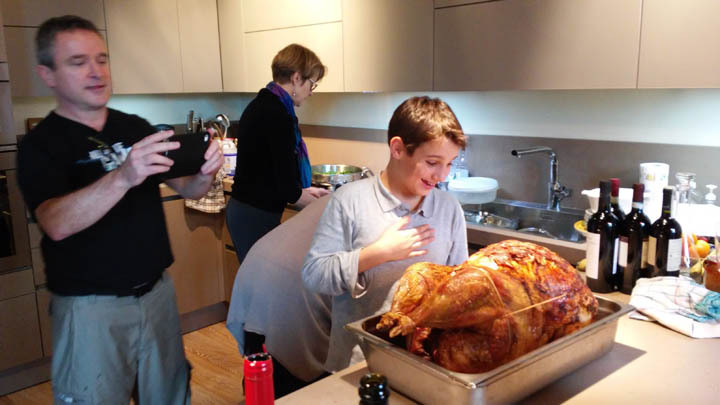 Eli, restaurant owner and British, had started the turkey at midnight and collaborated with her sister in Philadelphia on Skype. 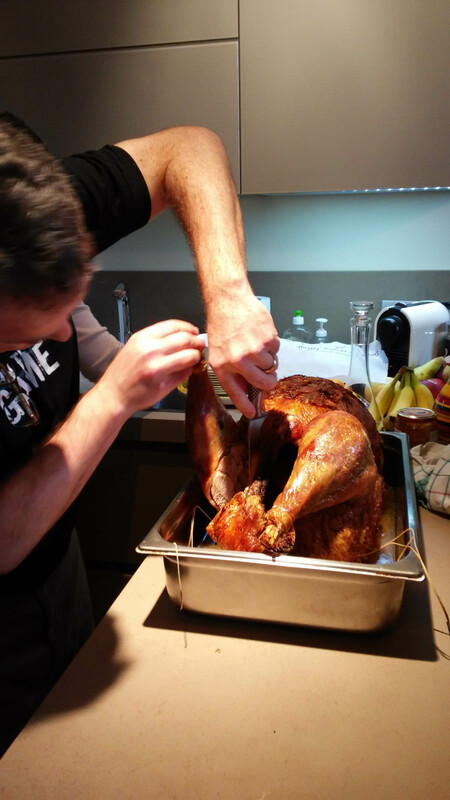 The turkey roasted for 12 hours. 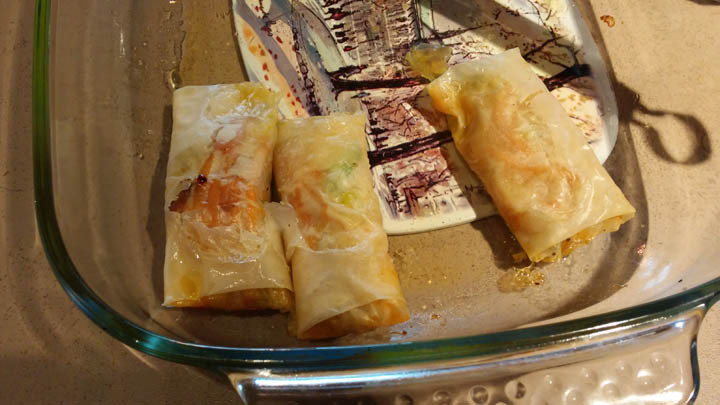 She also made some wonderful appetizers, a pork roast in case there wasn’t enough food (!) and a pie. She sent along the drippings for us to make gravy. 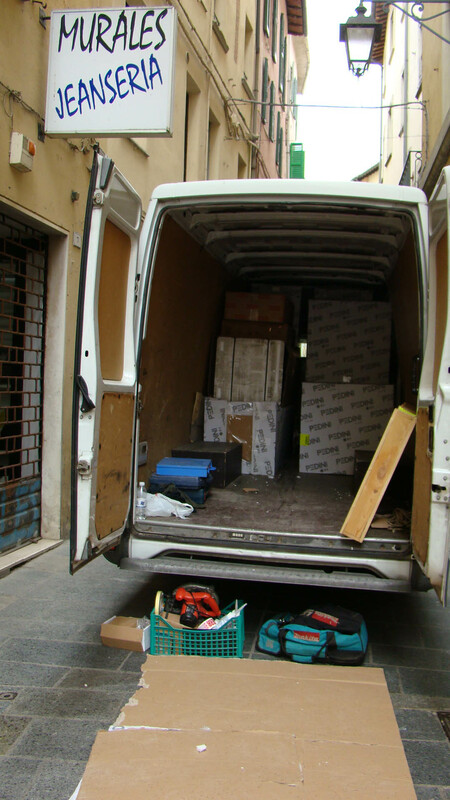 We started the preparations and Simone, Simona and Fabio arrived with contributions of their own. 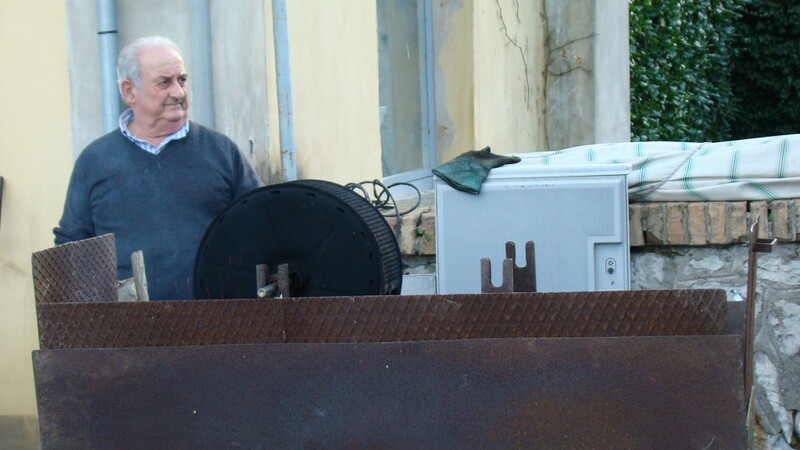 Simona and Simone are Milanese transplants who live off the grid on a farm south of Umbertide. Fabio is a technical guy and also creates olive wood utensils, lamps, etc. Fabio was the most excited of everyone. He had seen our Thanksgiving on TV and this was his first actual one. Most of the pictures below are from him. Antoinetta, Barbara, Emanuele and their boys arrived last. We had a prosecco toast and dug into the appetizers. Here are some pictures. Next we dished up the Meal. 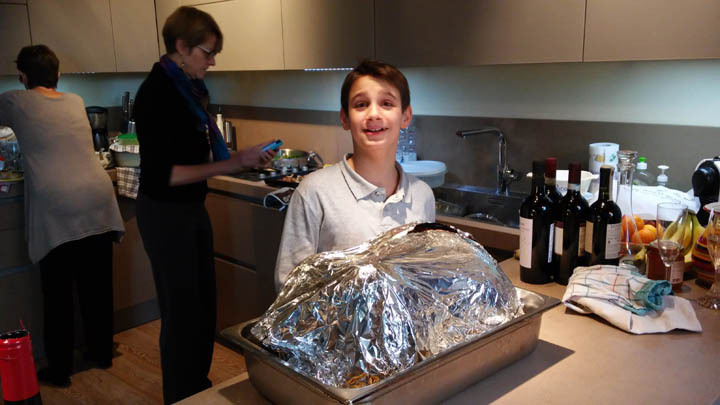 Here is the ENORMOUS turkey which had the boys in total awe! And the buffet with all of the dishes. I demonstrated to the Italians how to load up their plates and I was pleased to see they did so with enthusiasm. Fabio’s plate and the table. 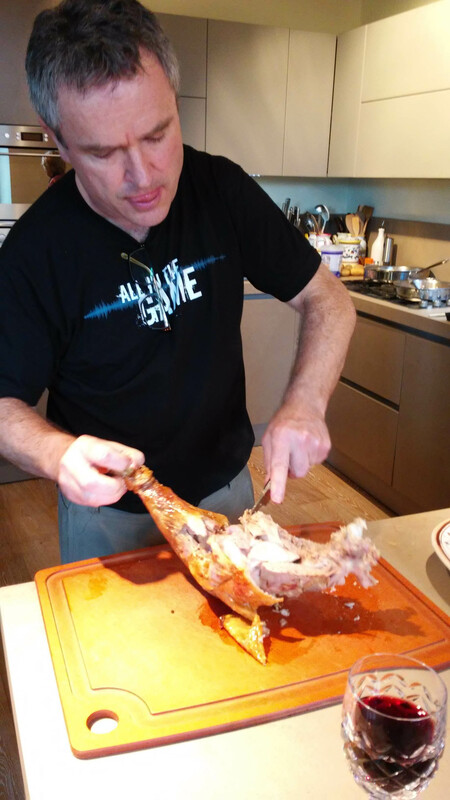 Mark stepped up to carve the bird. And finally we all sat down to the feast. 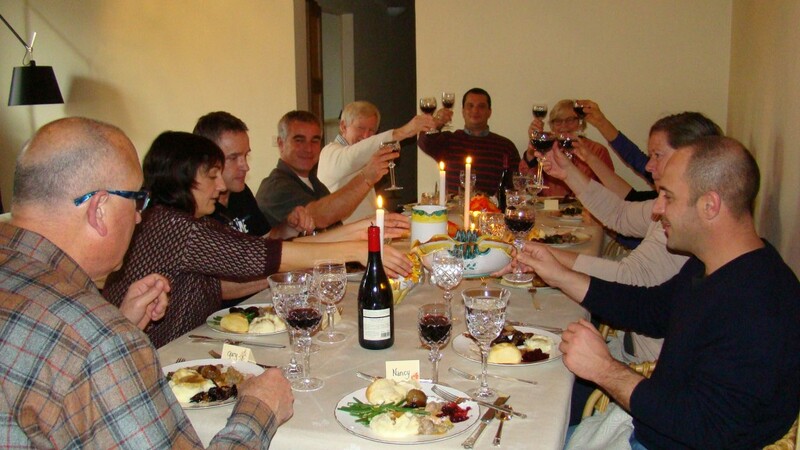 We gave a toast to our friendship and our ability to share a wonderful, international meal. Luther had helped with the wine selections along with Gary and Mark. Susan had made a pumpkin pie. There were two other pies we were too stuffed to eat. 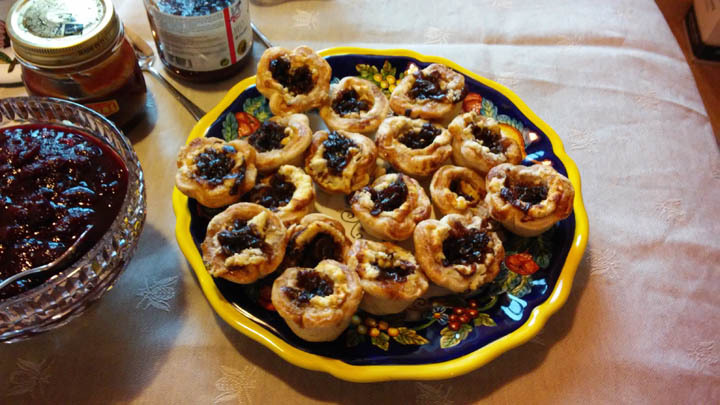 This entry was posted in Eating, everyday life in Umbria, Umbertide, Uncategorized on November 28, 2014 by Nancy Hampton. On Thursday I watched out the window as they unloaded a big, round concrete thing with a hole down the center. 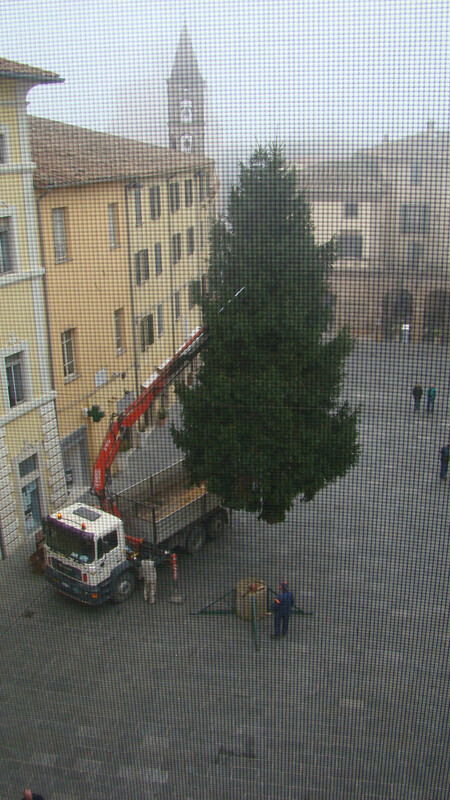 I realized it must be fore the Christmas tree in the piazza. Sure enough a couple of hours later a truck began to maneuver itself in. 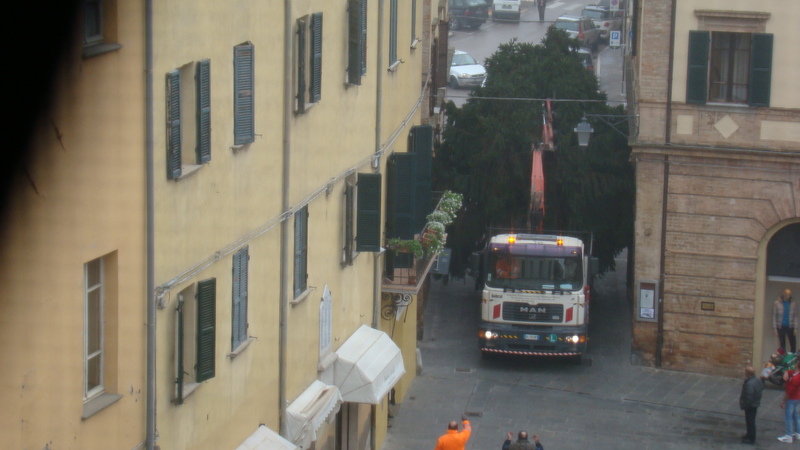 There was a difference between the way the tree is transported here and in the US. I have seen plenty of the trees that are brought into Washington DC, the capital etc. and they are trussed up tightly and on a very long flatbed truck that accommodates the full length. Not here. No trussing. Small dump truck style truck. I wondered how they must have gotten along on the highways. The tree spilled out the sides etc. 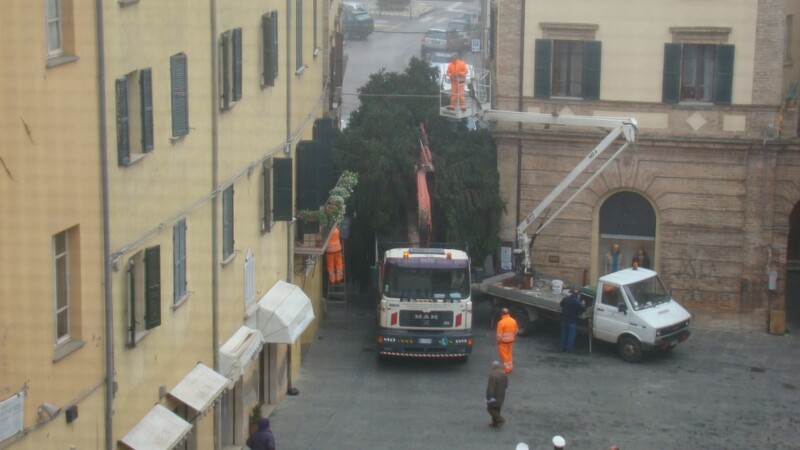 Here are pictures of them trying to get down the narrow street into the piazza. After the cherry picker managed to push the branches down so they wouldn’t take out the street lamp, the workmen had to go into the apartment on the left with a balcony full of flowers and help the old man there move them. 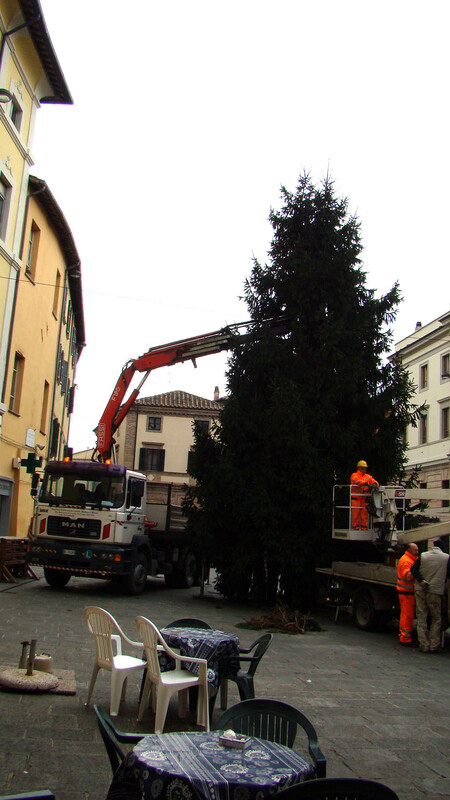 Finally it was in the square and suspended above the ground so they could trim the trunk to fit in the hole. Sorry about the screen. Here is the tree from our front door after it had been anchored into it’s base. It really is a big beautiful tree. I can’t wait to see it decorated! We talked to Emanuele yesterday. Things are really shaping up over there. I am actually starting to get excited about moving in! He said next Saturday would be a good day – a week from today. He told us we couldn’t move in on Monday or Friday as they were bad luck days to move into a house. Oh-Kay. I asked him to attached my magnetic knife holder to the wall. I had bought a new one to bring with me. He was quite amazed at it. He had never seen one. I guess they don’t have them here. He also will have the shelves from the living room installed in the pantry for me. Yay! I guess it’s the Capricorn in me but nothing makes me happier than tidy storage. And a final note. Last night in the middle of the night I was woken by a band playing. I got up and there, in the middle of the piazza, was a truck that had an entire band in it playing at the top of their lungs! I looked at the clock which read 4AM. I vaguely remember Susan mentioning this but I need to find out what the heck it was all about. Always something! They drove off out of the piazza to wake up the rest of the town. 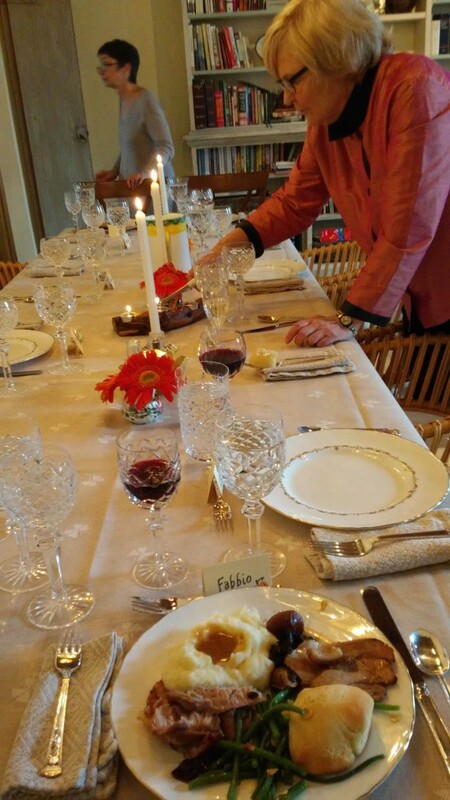 This entry was posted in everyday life in Umbria on November 22, 2014 by Nancy Hampton. It has been raining for the last two days. Progress in the house: electrician is nearly done. They have finished the plumbing hookups in the kitchen but the oven is out of the cabinet and in the middle of the floor. I guess they are having problems with the gas hookup or something. They moved the bed, mattress, dresser, shelves for office, table and chairs into the back. They are nearly finished painting the living room which is the last room. I am still unclear as to how they will refinish the floors. I don’t think it will be ready this week but we shall see. Today was a beautiful day. We were meeting Gary and Susan and their guests from California, Gina and Mark. We had reservations to take the full tour of the Monte Vibiano winery. 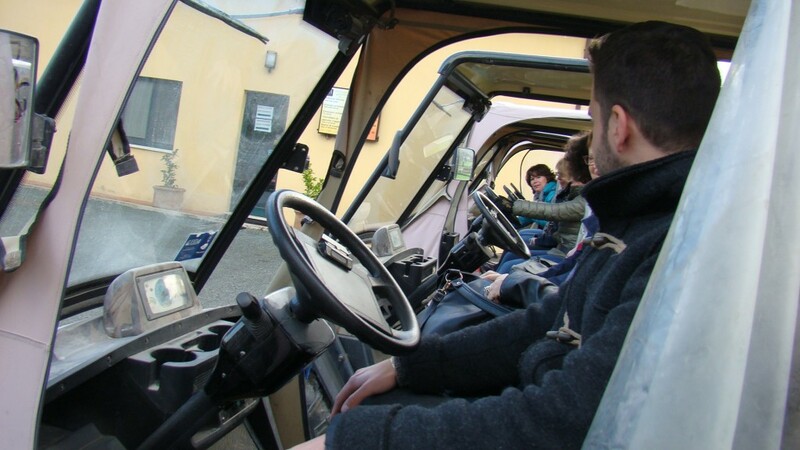 This entailed driving golf cars up into the vineyards and olive groves. They insist they are NOT golf carts but oddly enough the center of our steering wheel had a little clip to hold a score card. Hmmm. There was another group from Sweden, maybe 10 or 12 people. 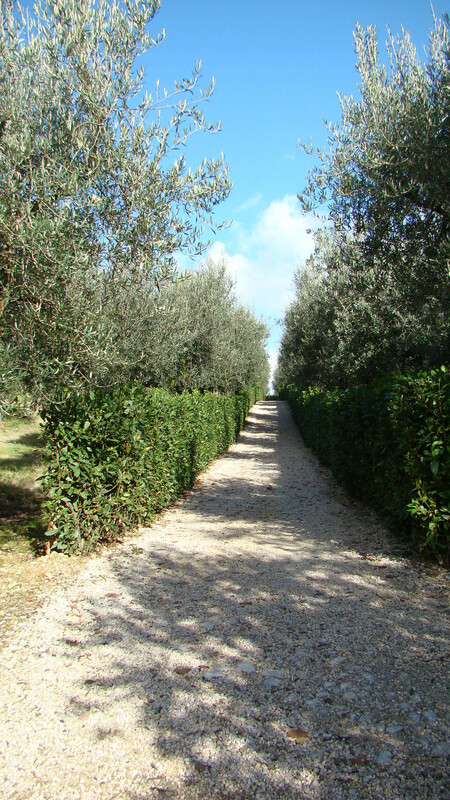 We all piled into the carts and off we went up through the village on tiny streets and into a beautifully manicured vineyard and olive grove. It was such a pretty autumn day with bright sun and still some color. Here are some pictures. 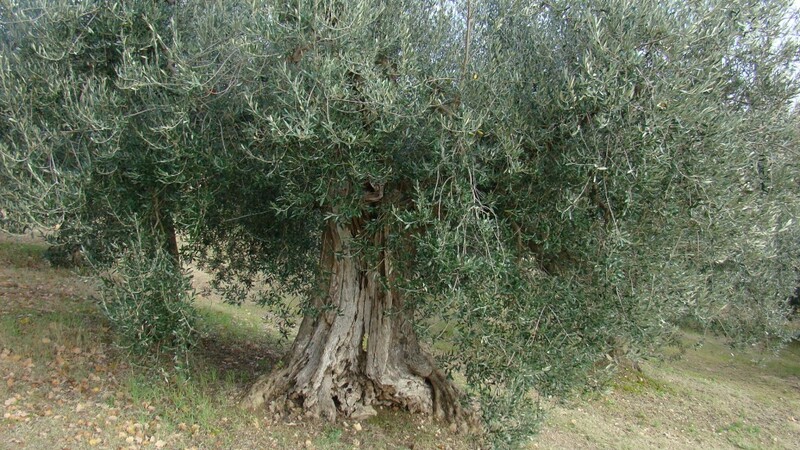 Four hundred year old olive tree. Narrow path we drove into the vineyard. After we returned we went on a tour of the winery. 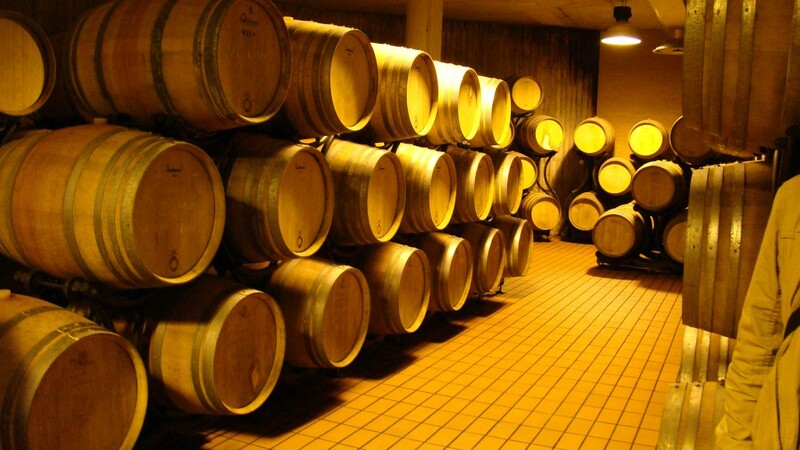 Here are the French oak barrels in which they age the wine. 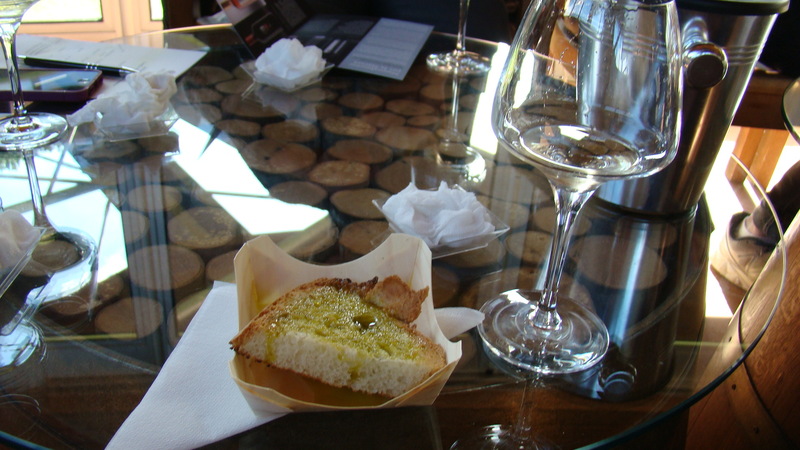 Then we tasted their four wines along with some of their olive oil. They have an interesting way with their oil. They put it into tiny bottles (10ml I think they said or one serving size) and then freeze it. They claim this keeps it as though it just flowed out of the presses. Could just be a gimmick but who knows! They have great marketing. After we left we headed to Panicale, which was pretty close, for lunch. Our intended restaurant was closed but there was another one in town so we ate there and it was good if not great. A lovely day and we enjoyed getting to know Gina and Mark. Gina and Mark had brought cranberries and allspice and cloves with them for my zinfandel cranberry sauce which I just finished making. 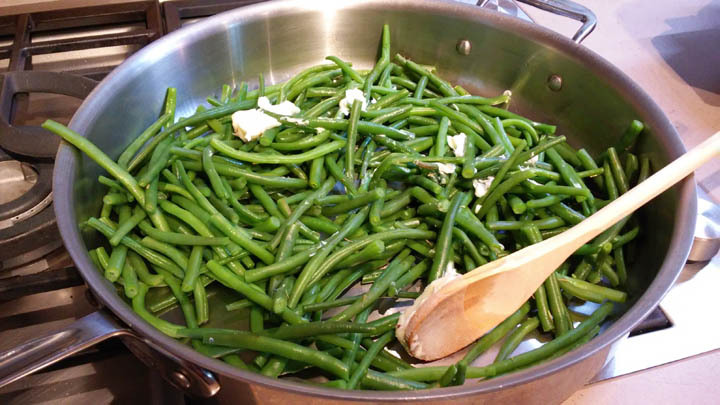 Thanksgiving is just a week away and the preparations are underway. 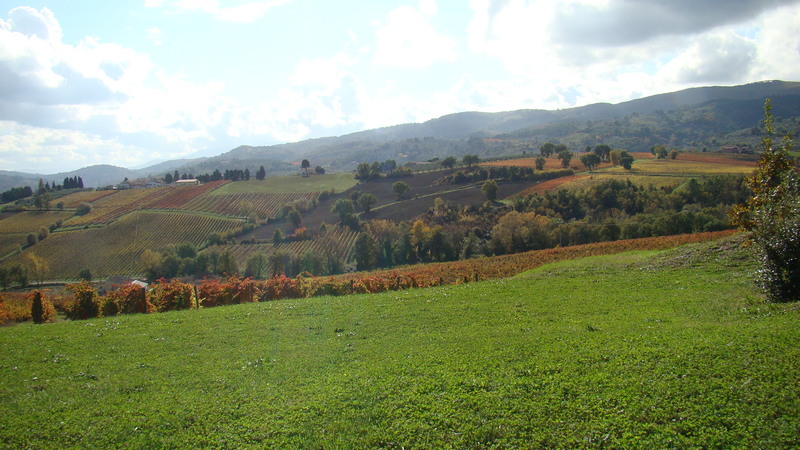 This entry was posted in Umbria, Uncategorized, Wine and wineries on November 20, 2014 by Nancy Hampton. Emanuele loaned a book to me called la Nostra Calvario or Our Calvary. It is mostly about Umbertide before and after the war focusing on the bombing. The Americans and British were trying to stop the Germans in their retreat and tried to bomb the bridge over the Tiber river. They sent four waves of planes each with four bombs most of which fell on poor Umbertide. 72 people were killed. The bridge was finally hit. Here is a picture of Piazza Matteotti where we have been living since our arrival. 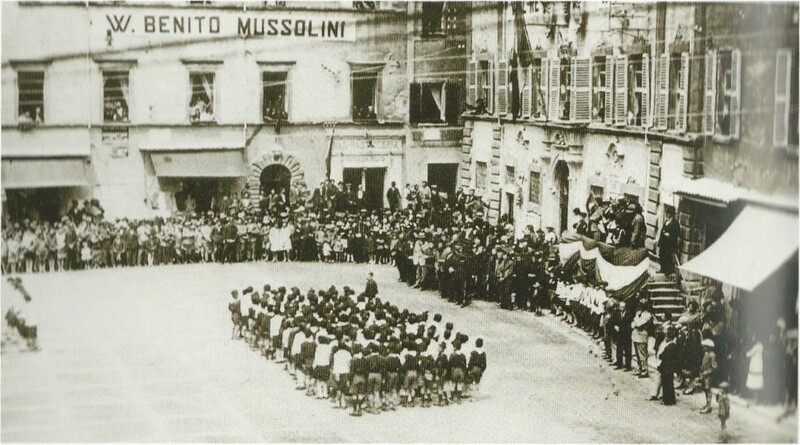 It was taken during a Mussolini rally. The door with the arch beneath the banner is the door to our building right next to the Bar Pazzi (Bar Mary today). 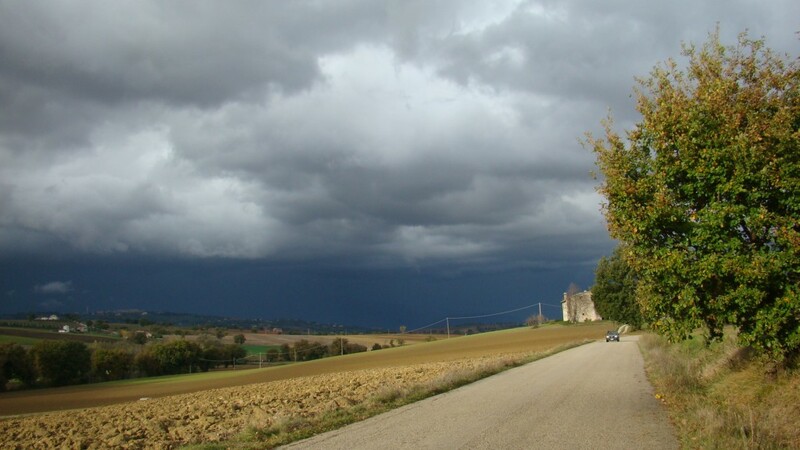 This entry was posted in Umbertide, Uncategorized on November 18, 2014 by Nancy Hampton. 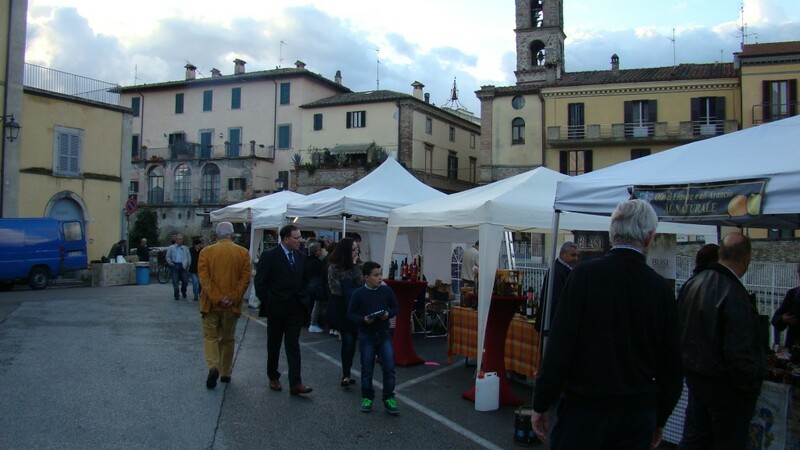 Yesterday was Sunday, November 16 and there was a festival called Cantine Aperte a San Martino or Cellars open for St. Martin. We had gotten a brochure with the participating wineries and a map from a winery we visited last week. 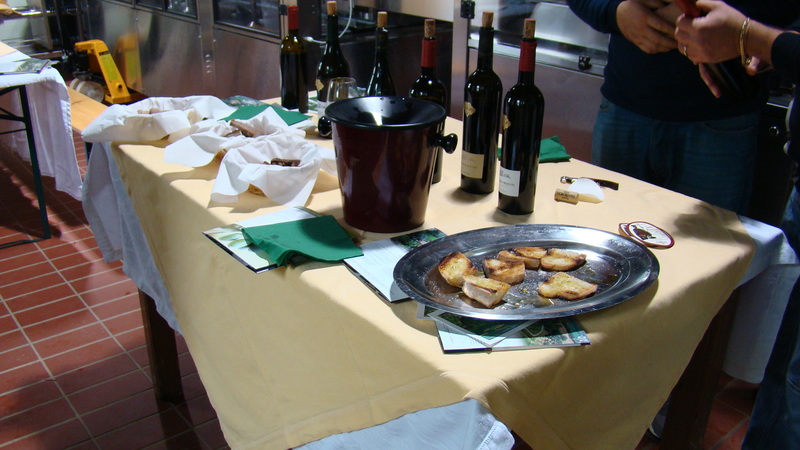 It was organized by Movimento Turismo del Vino Umbria. We had planned to visit one or two wineries and then have lunch and then maybe visit another. The weather was threatening. The first place we went was just south of Perugia and it was closed (!) and it was supposed to be participating. So we headed south near Todi. This one was called Roccafiore. It was quite an operation. When we arrived it was raining and after going inside where they have a gourmet restaurant, spa and hotel, we found out they, too were not opening the Cantina because of the rain. Shoot. We called and made reservations for lunch and decided to try one more. 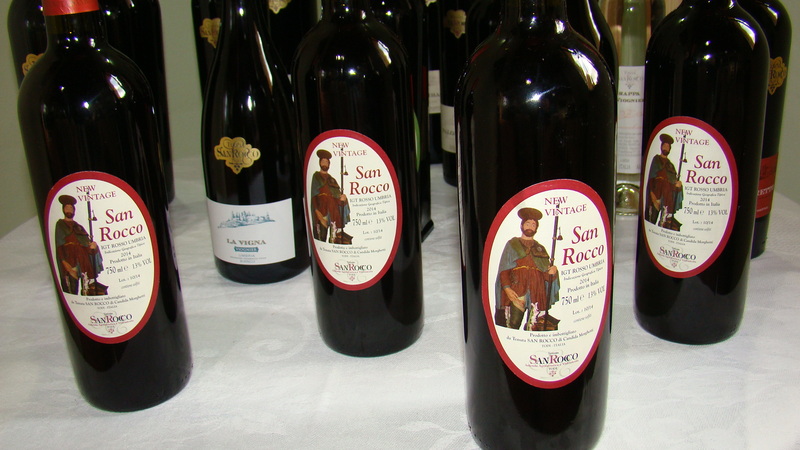 This one was called Tenuta San Rocco – a cluster of confusing buildings and it was POURING rain. Finally we found their make-shift tasting area which was in a newish building with the bottling machines. The man was very friendly and there was another guy and a young woman there. 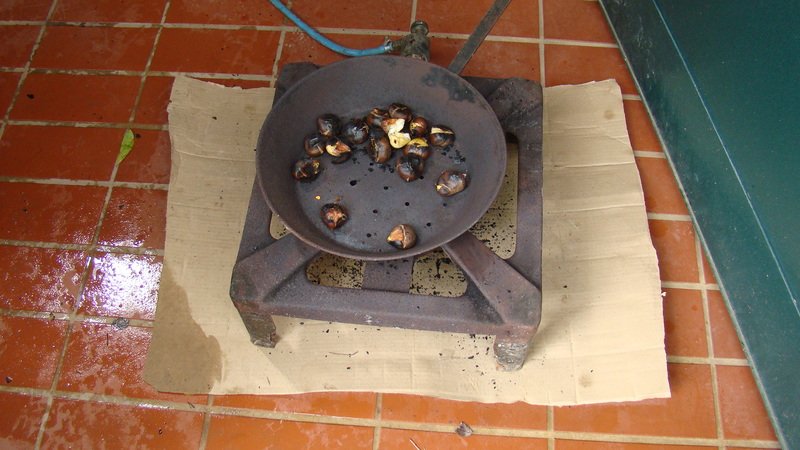 They not only served us wines but also two breads, a sweet, nutty cookie, and hot bruschetta and then they roasted chestnuts on a little brazier right there on the floor! One of the wines was the Vino Novello which is almost exactly like Beaujolais Nouveau from France. Very young and meant to be drunk right away. It was fresh and good. 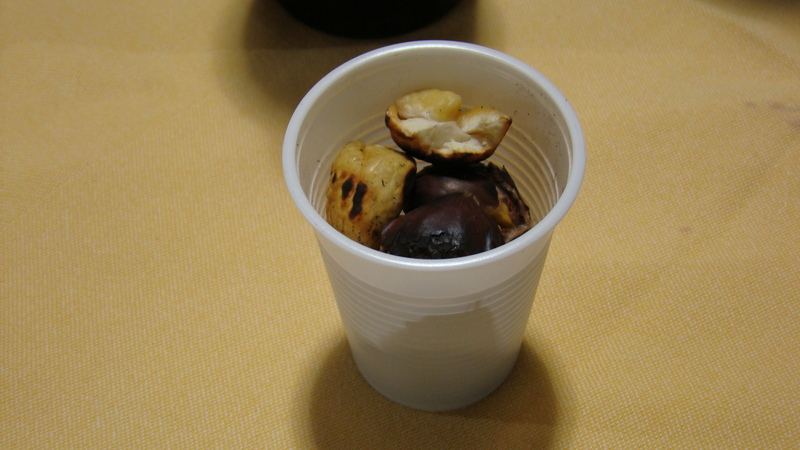 They explained that it was due to the St. Martin festival that they had olive oil, chestnuts, and new wine as it is the tradition. I found it all charming. They harvest everything by hand. At the end Dottoressa Grassini who is the owner and enologist came and met us. She also was very welcoming. All in all a very fun experience. Off to lunch at Locanda Rovicciano in Castel Ritaldi. 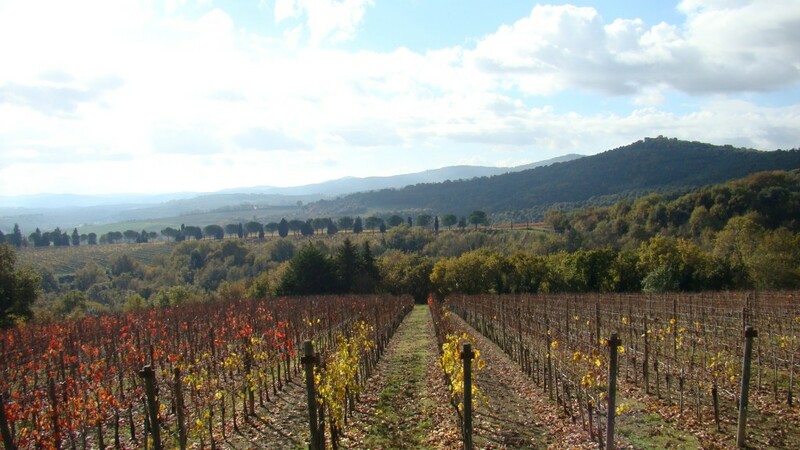 We found it in our Gambero Rosso Ristoranti d’Italia book. Excellent restaurant. We were seated in a room with a big fireplace. I bet it would be cozy in the winter. There were large Italian families dining and many children. It was fun watching them. The kids were pretty well behaved and could go outside and blow off steam while their parents ate and drank wine. The table in our room had four women and four men. The four men sat at the end of the table, then the four women all together, and then the kids. So strange. We would never seat ourselves like that in the States. I had the quail eggs with white truffles. 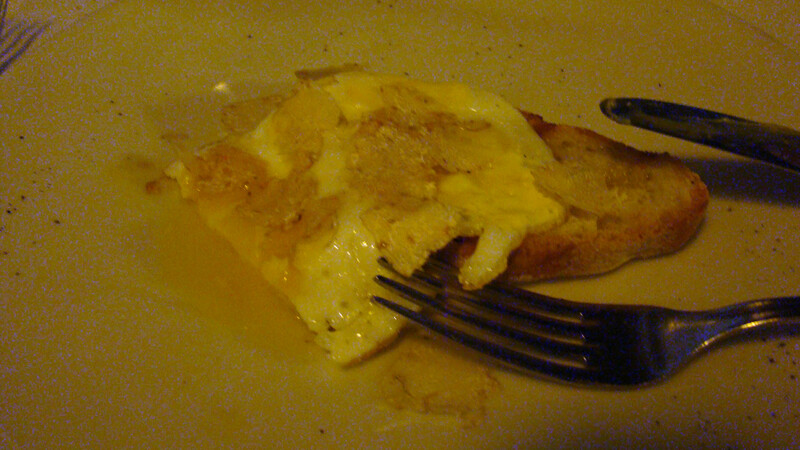 They were fried and place on top of toasted bread with shaved truffles. Yum! Luther had Maltagliata which means “badly cut”. And it was very irregular. It had onions and bacon. I had the spit roasted Quail for an entree and Luther had grilled lamb. He pronounced it the best lamb he’s had here. My Quail was tiny and crispy and smokey flavored and not too much food. It was wrapped in bacon and I am pretty sure roasted over a wood fire. Very Very good. My Quail. Here is the sky just before we went into the restaurant. Spooky! All in all a fun day. This coming week will see us moving into our own place, or so we hope. I finished unpacking what I could unpack so there are not so many boxes. We went shopping Saturday and bought a vacuum cleaner. A Dyson Animal. We hope that will help us keep up with the cat hair. 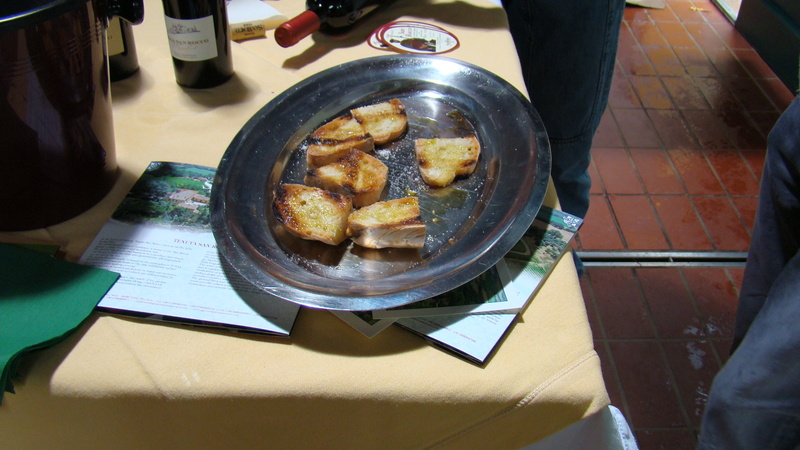 This entry was posted in Eating, everyday life in Umbria, restaurants, Uncategorized, Wine and wineries on November 17, 2014 by Nancy Hampton. It has been some time since I posted because it has been pretty busy. We met with Emanuele in the house to discuss his issues with Pedini and the kitchen. Good thing he is paying attention as I had not noticed the issues. 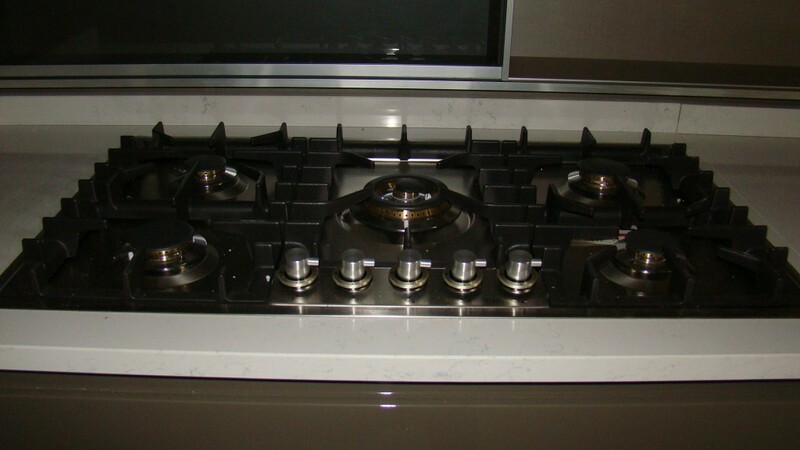 Biggest issue is that the hood over the stove has the lights about a third of the way under the sliding units that are on the wall. So we would never be able to change a bulb! Yikes. 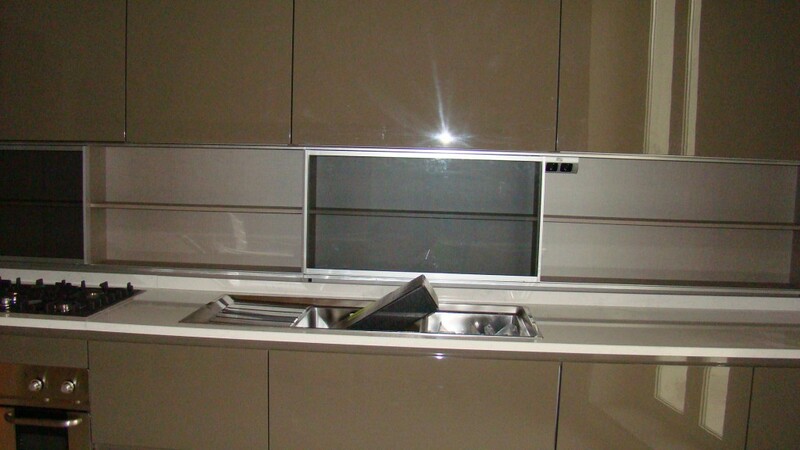 The second issue is that the quartz pieces that sit at the back of the counter along the wall has about an inch gap between the top of it and the sliding units. 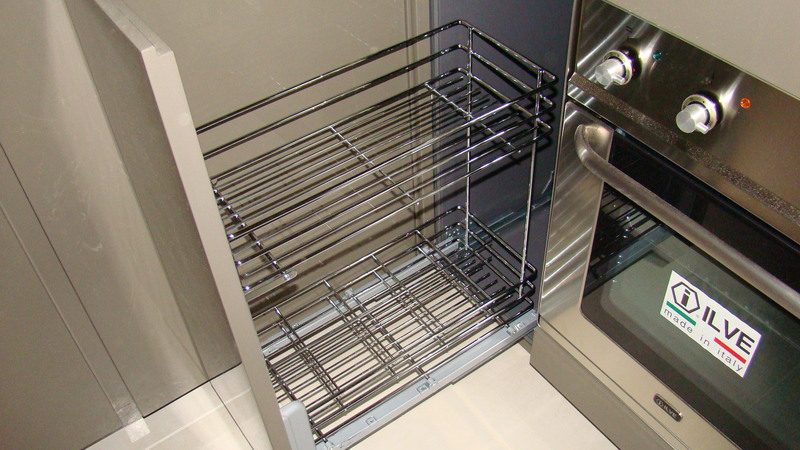 It would be impossible to clean in there and it would be bound to get spatter and grease in there. 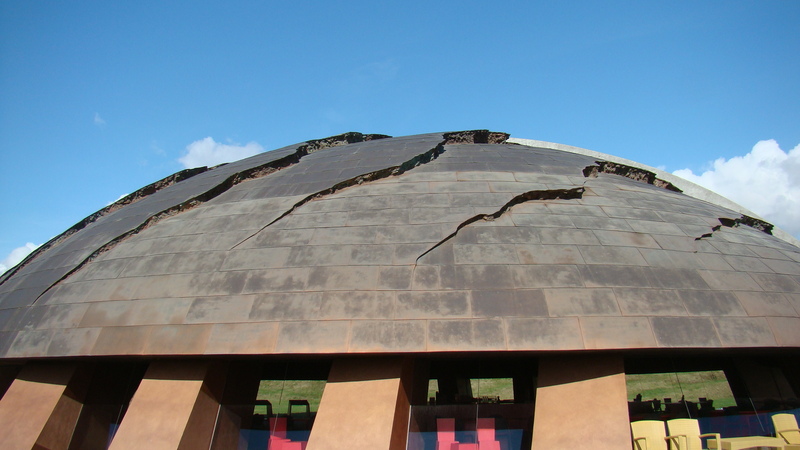 He has told Pedini they have to fix it and they should be back next week. Since then I have begun to unpack the boxes of kitchen stuff and put it in the cabinets to at least get some of the boxes out of there. It is not at all organized yet but it is all in there. I had not mentioned that I had been worrying about my hip as it has been bothering me more and more. I had taken a little fall back in July and I had worries that I had damaged it. Being in a foreign country I was majorly stressed about it. I asked Susan to ask her doctor for a recommendation. She mentioned it to Emanuele and he was ON it. He had knee surgery last year and managed to wangle an appointment with his doctor who is very, very well thought of in the field. I was very nervous before the appointment. It turns out that everybody goes with you when you go to the doctor here. It is very strange but I was happy to have the company and help. Susan, Barbara (Emanuele’s wife) and Luther all went with me. They all went with me everywhere including into the doctors office! They could translate for me and hear what the doctor was saying. He was a really nice man and very competent and he told me after manipulating my leg and seeing where my pain was that it was probably not the joint but muscular due to one leg being longer after my surgery. He scheduled X-rays for me right then and there. We trooped down to the ground floor where we waited in a waiting room with a bunch of other people. The entire building is incredibly dreary with glaring fluorescent lights and ether orange, lime green or dark gold walls and mismatched furniture. It took a while but we got them done and trooped back to the Doctor who told me there was no problem with the replacement. Blessed relief! I have many problems that are all together making me have the pain. The longer leg, curved spine (old news) and other hip has arthritis as well. He told me I must always wear a lift in my shoe and I should do Physical Therapy. Since I am not on Italian health care yet I was in as a private patient. He took us to another office where we were to pay. It cost 150 Euro for the doctor and 23 Euro for the X-ray. Just think what I would have paid in the US! This entry was posted in Uncategorized on November 15, 2014 by Nancy Hampton. It’s Tuesday – Veterans day in the US. Our kitchen arrived yesterday at 10AM. There are a LOT of pieces. I have not been bothering the workmen but they are supposed to be finished by 6PM today. It’s 4:30 and I’m dieing to go and see! This morning we went furniture shopping. First we went to Chateau d’Ax which has some nice furniture and I had not visited it yet. 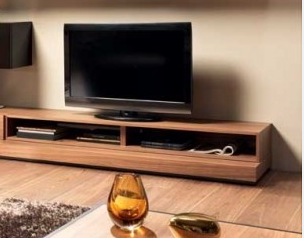 I saw some nice kitchen tables and one coffee table I liked. But not that much. 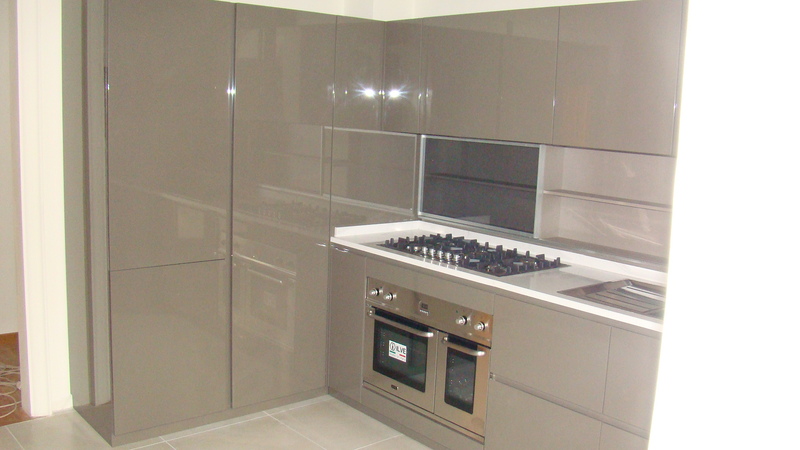 I also still have to see the finished kitchen to get an idea what size kitchen table we can accommodate. We headed over to Divani & Divani which is the Natuzzi store where we got our sofa. I just love their stuff. It’s a bit pricy but Oh well! Luther found a TV stand he liked and then we found a coffee table that went with it. I didn’t take pictures. Here are a couple but they are small. A side note. After all these years of cooking I learned something new. You may already know this so just call me ignorant if you do! You know how recipes say keep a cup of the hot pasta water to put in the sauce? Well I found out you need to put the water into the sauce and get it simmering. Take the pasta off the heat BEFORE it is cooked al dente. Then drain and put into the sauce and cook it the rest of the way in the sauce. 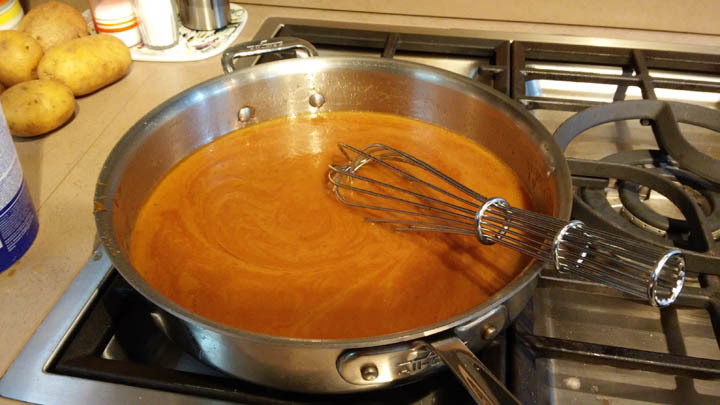 It allows the pasta to soak some of the sauce into it as it finishes cooking. I found it to make the pasta much better. Doesn’t work so well with creamy sauces. It is dark and 7PM and they are not done yet so I will wait until tomorrow to see it. OK, now it is Wednesday morning and I couldn’t sleep for wanting to see the kitchen. I went over before Luther even got up. It is beautiful, or I think so. Very sleek Italian styling. They are not quite done I think because the counter top bits that go around the edges are loose. And since there is no electricity yet nothing can be tested. Here are some pictures. 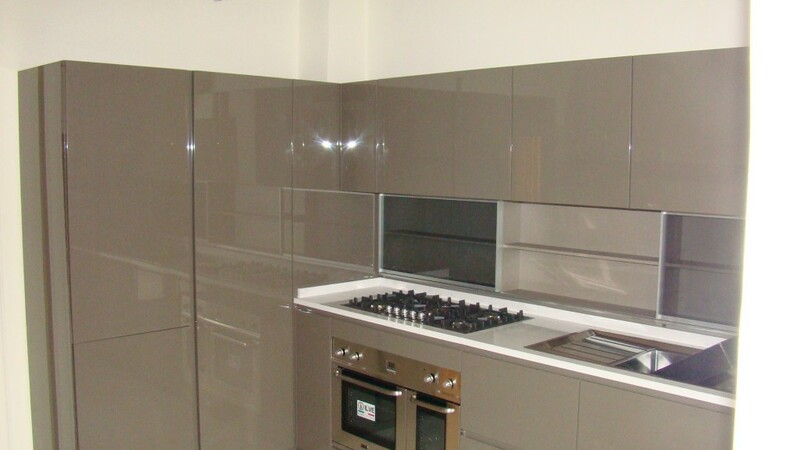 Notice the “back splash”. 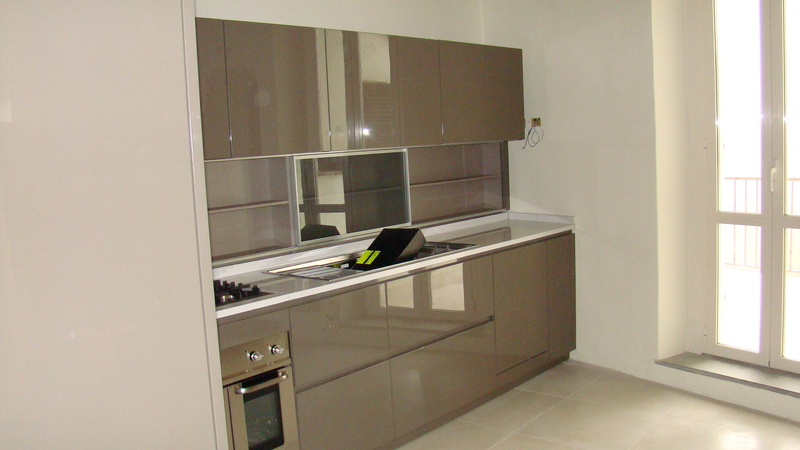 It has shelves and sliding glass doors for bottles etc. 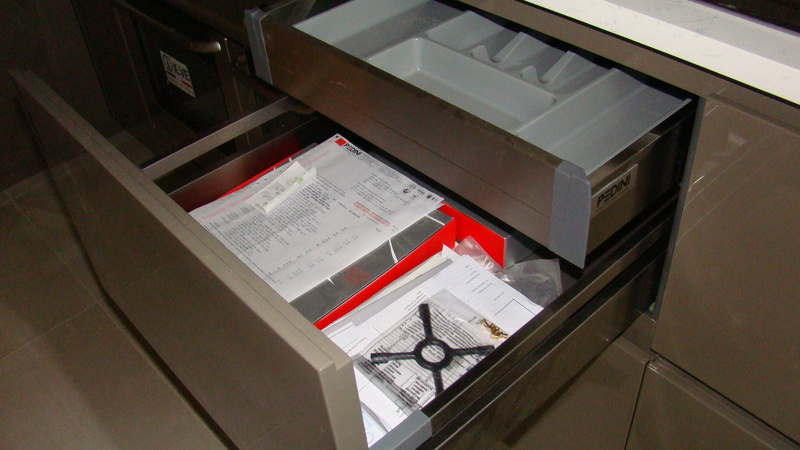 See the drawer inside a drawer feature? 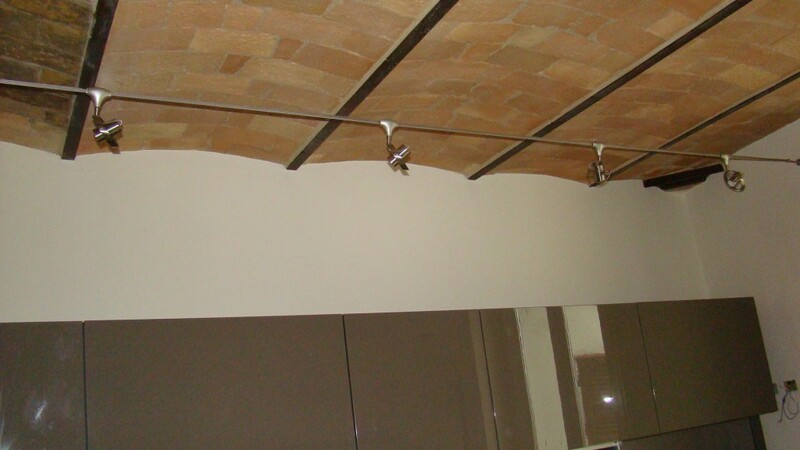 This entry was posted in everyday life in Umbria, House renovation, Uncategorized on November 12, 2014 by Nancy Hampton. 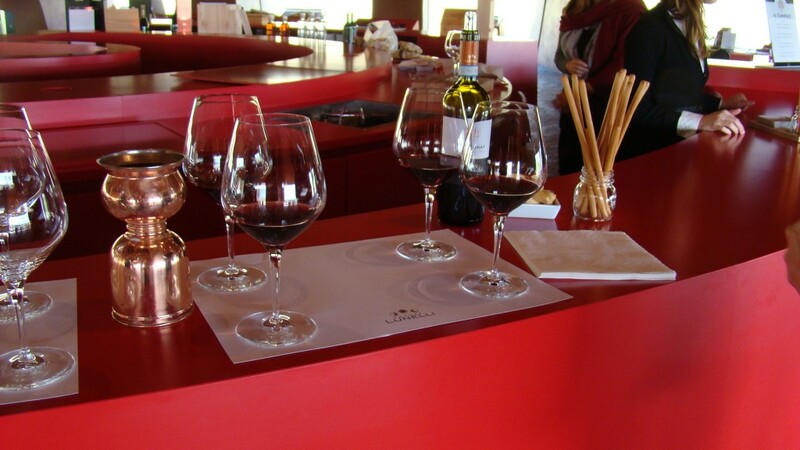 Yesterday (Sunday) we decided to visit a restaurant with Susan and Gary that was recommended by our local Enotecca and also visit a winery in the Cannara area. This town grows the famous Cannara sweet onions to be found only here in the world! The weather was just spectacular for November 9. 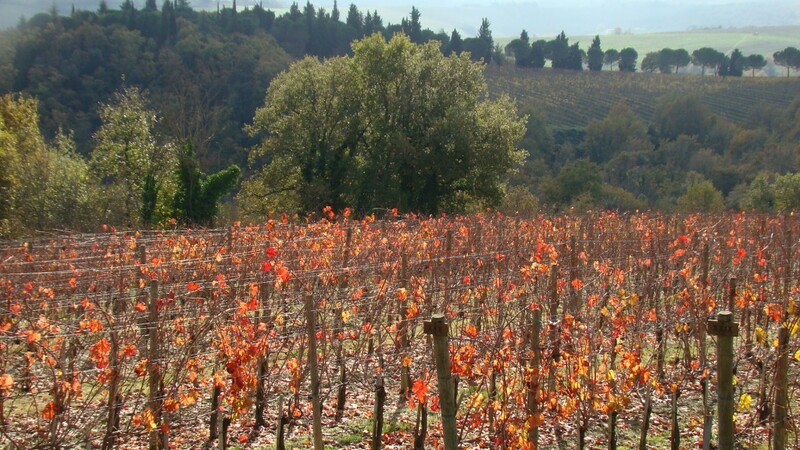 Warm enough for shirt sleeves and with that lovely Autumn slanting sunlight on the grapevines that have turned red and yellow. First the winery. 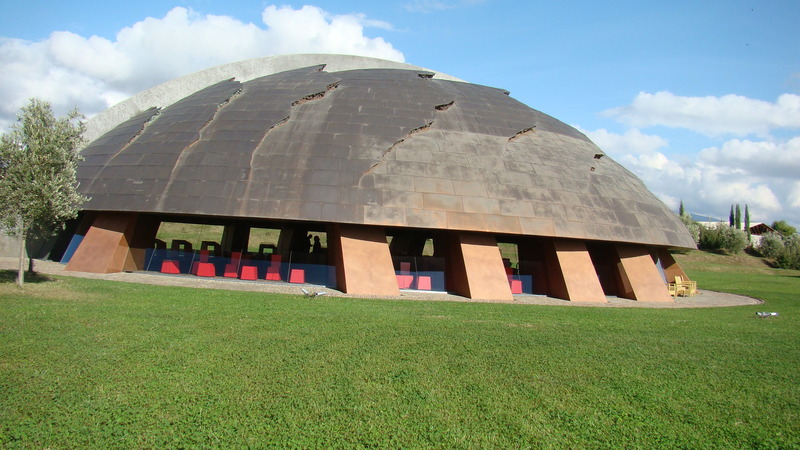 We headed up into the hills and stopped at an ultra-modern winery. It was not the one we intended to visit which was further down the road. 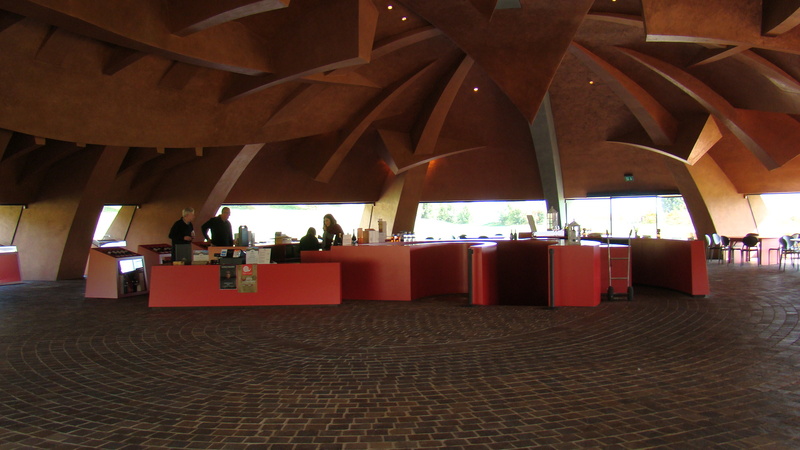 This one, Tenuta Castelbuono had an enormous tasting room and some sculptures. I cannot imagine how much it must have cost. Perhaps it is um, money laundering? Anyway, they had two Sagrantino wines which we tasted and bought. Here are pictures. Click to appreciate the colors of Autumn. 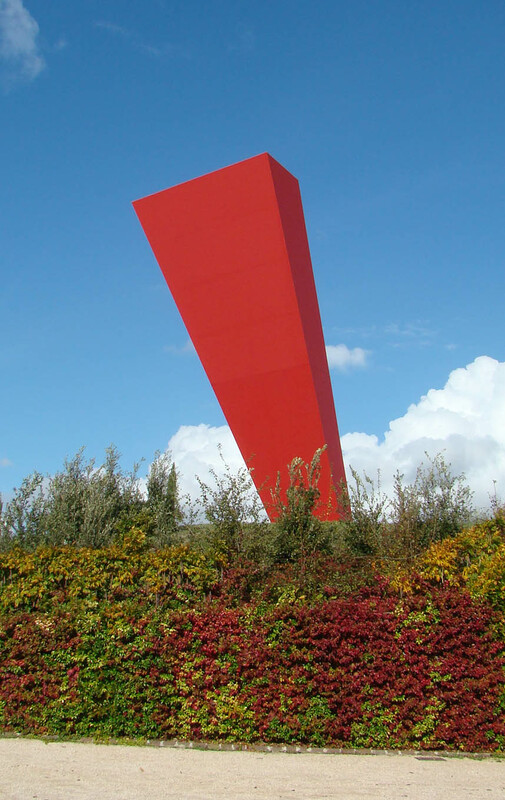 The structure was designed by a sculptor. Very unusual. After we visited this winery there were few others open on Sunday so we went to Cannara of onion fame. We drove into this little town which is situated on the Topino river, another St. Francis town with two medieval churches and the site where he gave his sermon to the birds. It used to be to be a lake until it was drained in the Middle Ages. We passed a sign advertising onions or Cipolla for sale. Couldn’t pass that up – world famous and all! We rang the bell and the lady came out and took us into the shed. As we entered the gate another car stopped with a family inside and asked us if they sold onions. We said yes and he was thrilled and gave out a Bellisimo and stopped to buy also. Only Italians would get this excited to buy onions. The lady began scooping onions into a bag, and scooping, and scooping! 2 kilos later (about 4 lbs) we left. Fun. Now onto our restaurant called Hazienda Ristorante Cafe. What else would you name an Italian restaurant? It was one of those holiday places. It had apartments to rent for holiday makers and a swimming pool, great views of Assisi up on the mountain. We ordered the 4 course degustation menu. After we ordered the owner warned us that it was a LOT of food. Uh oh. Well it was a lot but we managed it. No picture, sorry. 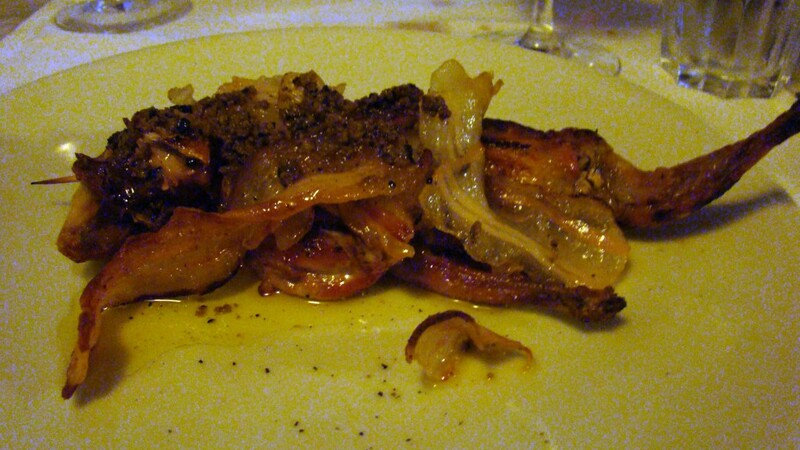 We had an antipasti with several fried specialties like onion rings (famous onions!) fried sage leaves etc. Next was a pretty plate with three fried dough circles on which were three poached (famous) onions on top of a parmesan cream sauce with drizzled balsamic (heaven!). Next were Raviolis in a parmesan cream sauce. The Secundo or main course was supposed to be horse but we couldn’t deal with that and had them substitute lamb, grilled, not great. Over done and gristly but thankfully not a lot to eat. We skipped dessert. Burp! Back in Umbertide they were having a big market with clothes, jewelry, roasted chestnuts and peanuts. Happening place. Pictures. Today, Monday, always a slow day. BUT it was an unusual Monday because our kitchen was due today!! I went over to the house to grab some things I needed and take a little walk. They were washing the floors in preparation for the kitchen. We also got good news from Gary that Luther’s long-in-coming medicines had been delivered to him (2 months!). It is so funny, Luther’s name was on the package, we had my sister send it to Emanuele’s office but no-one was there. BUT they knew other Americans lived nearby and they MUST know the recipient so went to Gary’s house. He paid the duty and we met on the Piazza to take delivery and pay. 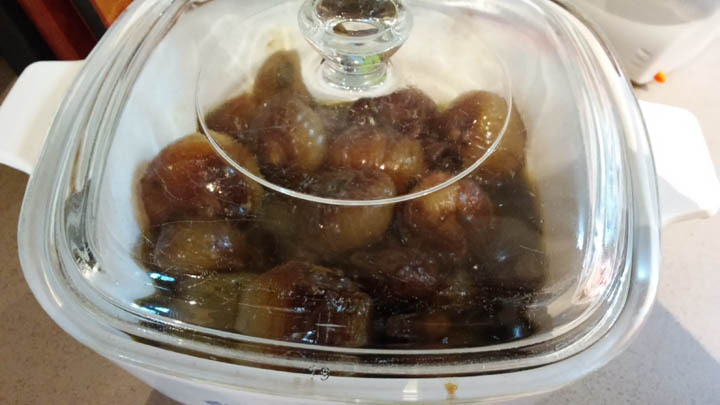 Also Susan brought me my share of the Famous Cannara onions. Now I need to figure out how to fix them to take advantage of their special qualities. 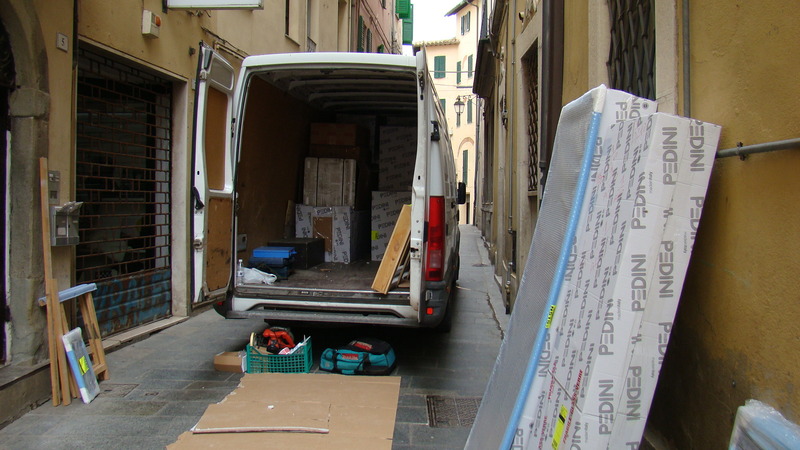 Here is the Pedini truck delivering our KITCHEN!!! I’ll go over tonight to see the progress. So exciting!! 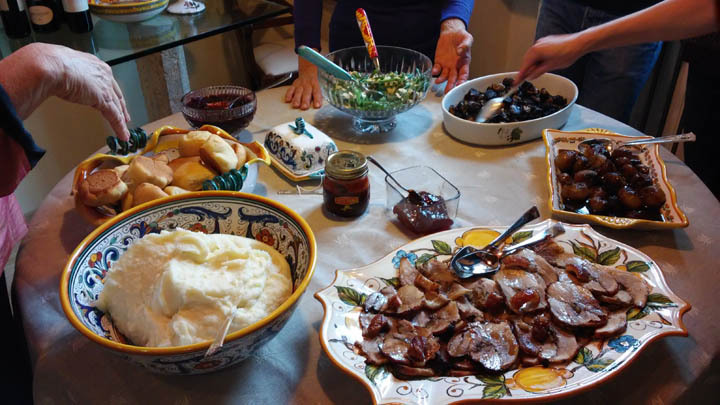 This entry was posted in Eating, everyday life in Umbria, Italian life, restaurants, Umbertide, Umbria, Uncategorized, Wine and wineries on November 10, 2014 by Nancy Hampton. I was wrong about my cold. It didn’t go away. I still have it but it is very manageable. Also I still have internet on this computer! Yesterday was market day. Typically we don’t go anywhere in the car on market day because it would mean losing our parking space. That is OK because on market day, everything comes to us! We did some shopping for cheese and vegetables. It was cloudy and windy but not cold. Just when the vendors were tearing down the heavens opened up and it poured. It poured all afternoon and into the night. I checked the weather report and it looks as though this was the first day of five straight days of rain. They are already having floods in Rome. Today we woke to rain as advertised. The Tiber river is swollen and full of debris. We had planned to go to the furniture store and order our mattress and bed frame today. So we moved ahead with plans. First we stopped into our apartment to retrieve our rain coats which we had not needed since we came. I was happy to see the electrician has installed the wires across the ceilings that will hold our halogen spots. Ordering the bed and mattress was difficult mainly because we have a mattress now. And we have a platform bed frame. Trouble is, the mattress does not fit the platform. This means we have to buy a bigger mattress for the platform and a frame for the smaller mattress. This was VERY difficult to explain and make clear to the kind man we are dealing with. He called his daughter who spoke a little English but not better than Luther’s Italian. 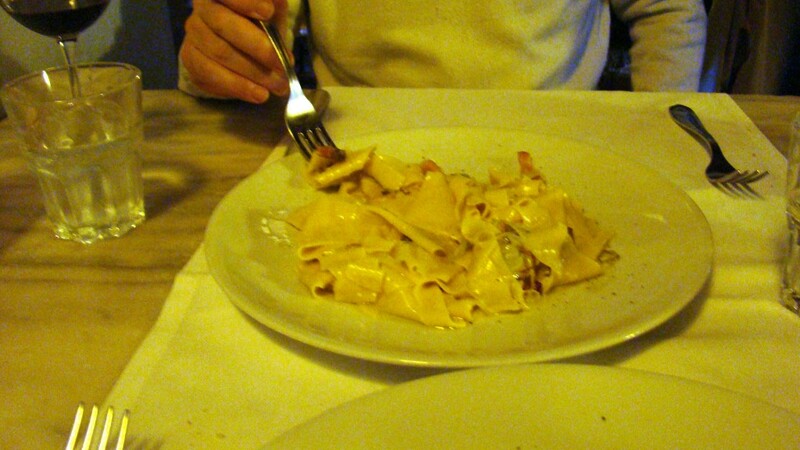 Anyway, in the end we managed to order it. Or I think we did 🙂 Always an adventure. Now it is evening and it is still pouring outside. Luther was not happy as he has missed his runs. He was going to go but thought all the Italians would think him an idiot and they probably would! I suggested he walk up and down our many flights of stairs. Kind of his own personal stairmaster. Which he did! 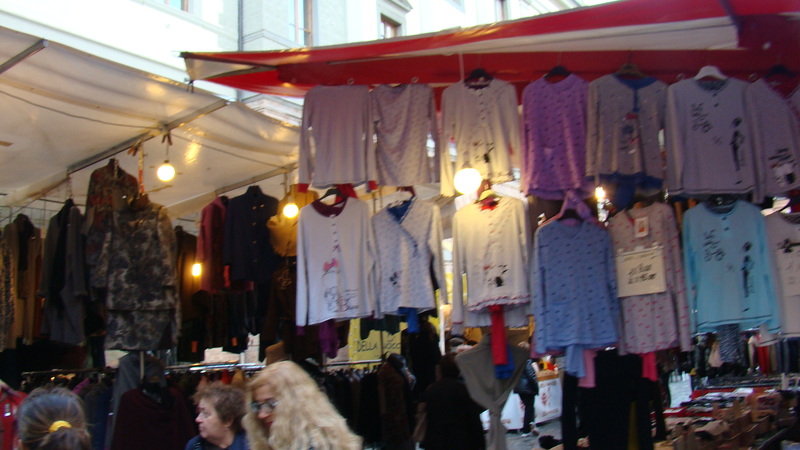 This entry was posted in everyday life in Umbria, shopping on November 6, 2014 by Nancy Hampton.